According to the latest regional appendix to the upcoming Ericsson Mobility Report, the first 5G subscriptions in the Middle East and North Africa region are expected during the period 2020 to 2022, reaching around 17 million subscriptions by 2023. 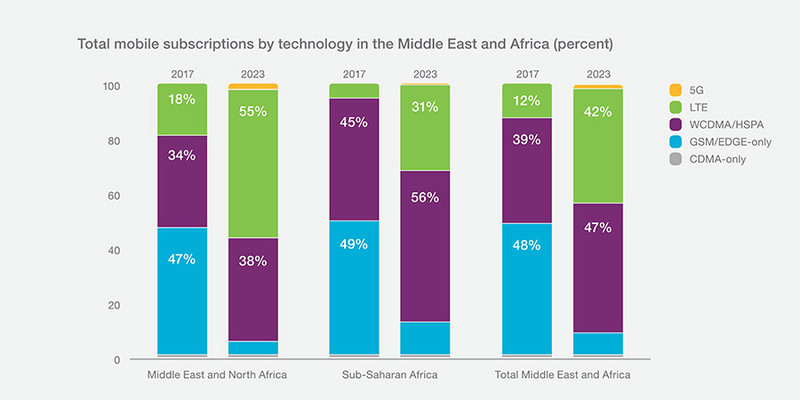 The Middle East and Africa (MEA) region, which encompasses more than 70 countries, faces extreme market variations in terms of Information and Communication Technology (ICT) maturity, but Ericsson's Mobility Report nonetheless predicts a region-wide growth in mobile subscriptions from 1.590 million to 2.030 million by the year 2023. Further, the MEA region will witness a nearly five-fold increase in LTE subscriptions, from 190 million to 860 million, in the same timeframe. Rafiah Ibrahim, Head of Ericsson Middle East and Africa, said: "Total mobile traffic for the region is forecasted to grow by around 49 percent annually between 2017 and 2023. This rapid growth is seeing operators increasingly exploring methods of optimizing their networks with more capacity and coverage. We are supporting operators across the region throughout the different phases of the network evolution enabling best performing networks and differentiated customer experience." The MEA region has a young and growing population with a median age of 21 years which, combined with its improving economy and favorable policies, creates potential for continued growth in the uptake of telecom and ICT services. Particularly in the Middle East and North Africa (MENA), which has higher penetration rates of smartphones, mobile traffic, and mobile data traffic compared to Sub-Saharan Africa, operators will be faced with an increasing demand for faster network capability (lower latency and higher data throughput speeds) to deliver better application coverage for more consumers in the coming years. Across the MEA region, smartphone subscriptions are expected to increase from 670 million to 1.510 million in the next five years, resulting in data traffic per active smartphone multiplying nearly six times over, from 2.2 GB/month to 12 GB/month. Today, mobile data traffic in the region represents 83 percent of total mobile traffic, and is expected to increase to 98 percent by 2023, bringing it more in line with the global average. This will require operators to come up with efficient strategies differentiated by exceptional user experiences and optimal network performance. The Mobility Report's analysis of these factors considered the different strategies operators employ to approach these demands and found that the greatest challenge they face is employing available tools to maximize network utilization without negatively impacting the user experience. Moving forward, operators will need to find the "sweet spot" between the two, where a good user experience is delivered while still allowing significant volumes of traffic through the network. The Mobility Report also revealed that the Internet of Things (IoT) is facilitating the digital transformation of industries and providing mobile operators in the MEA with opportunities to explore new revenue streams. Cellular IoT subscriptions in the region are expected to grow from 35 million to 159 million between 2017 and 2023, at a compound annual growth rate (CAGR) of around 30 percent. This will enable operators to explore new digitalization opportunities as the world becomes more connected and industries experience an ICT-driven transformation. In fact, 5G-enabled industry digitalization revenues for MEA are predicted to at USD 242 billion between 2016 and 2026 - meaning ICT players must adopt and integrate digital technologies into specific industries to generate new revenues. 5G will be an important technology in growing industrial digitalization, and despite IoT being in its infancy in much of the region, there are still examples of how it has already helped improve the livelihood of MEA communities and industries. These include smart agriculture initiatives in Turkey and Africa, remote monitoring of oil wells and temporary networks in case of disasters in Saudi Arabia, and Narrowband-IoT (NB-IoT) being used to address utilities and smart meters in South Africa. Technologies like 5G and IoT will serve the region's diverse operator needs by opening up new revenue streams as a result of industry digitization, improving standards of livings in countries across MEA. Perhaps the most striking and indicative finding of this latest Ericsson Mobility Report for MEA is the fact that, despite being amongst the fewest, LTE connections will show the highest growth rate at 46 percent annually over the next five years. The report also forecasts that total mobile traffic will continue to rise in both the Middle East and North East Africa, at a compound annual growth rate of 48 percent, driven by higher mobile data traffic and increased penetration of smartphones in the region. As a result, operators will be faced with increasing demand for faster network capability (low latency and higher data throughput speeds) to deliver better application to enable widespread uptake of the 5G and IoT technologies of the future. In the face of such widespread technological advancement, operators, governments, and industries are investigating what new opportunities these technologies will bring as the Networked Society comes increasingly closer to reality. As more devices, sensors, and appliances connect to each other and to the internet, security and sustainability continue to be strengthened and optimized, paving the way for a truly connected world. The resulting technologies will empower people, transform industries, and enable the smart city solutions that will reshape the future in the Middle East and Africa.